Order within the next... 5 hours, 25 minutes, 24 seconds ...for dispatch today! 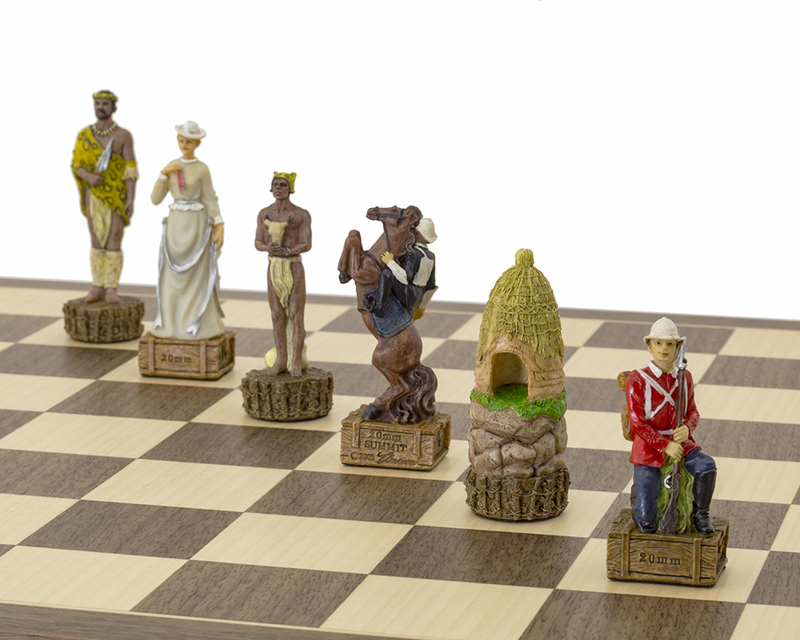 Italfama have amazed us again with their beautiful British v Zulu Chess Men. Every single piece is so beautifully crafted and ornate. 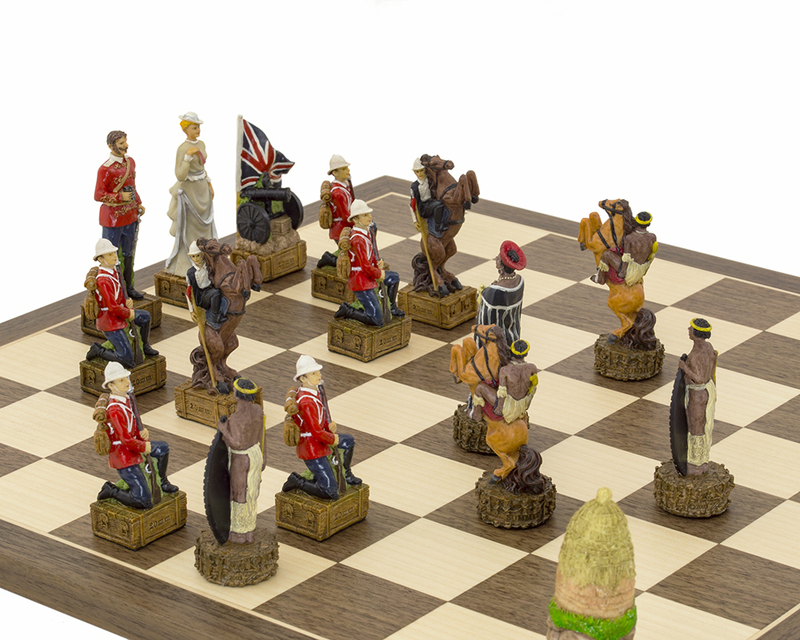 The Zulu King, Cetswayo, in his tribal gowns, is every inch a regal commander whilst Lord Chelmsford and his wife Adria make an elegant British military couple. 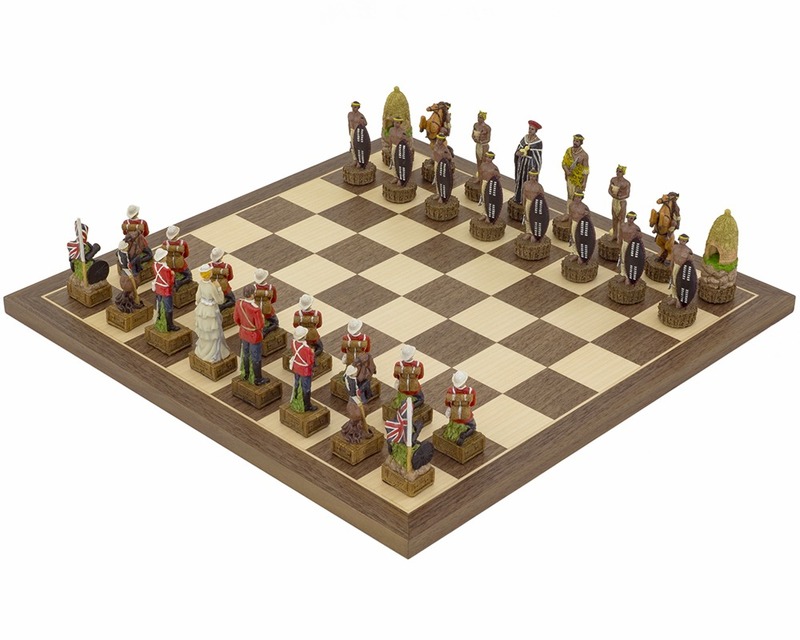 The Zulu pieces are very striking in their detail. The majestic Queen with her flowing robes and urn, the all knowing ‘bishop' with his cattle skull right through to the pawns and their beautifully decorated shields. Portraying the Zulu rooks as dwelling huts is pure brilliance. Nobly adorned in their red and white uniforms, the British Military are armed with pistols or bayonet firearms. A Union Jack flying proudly above a cannon depicts the rooks. 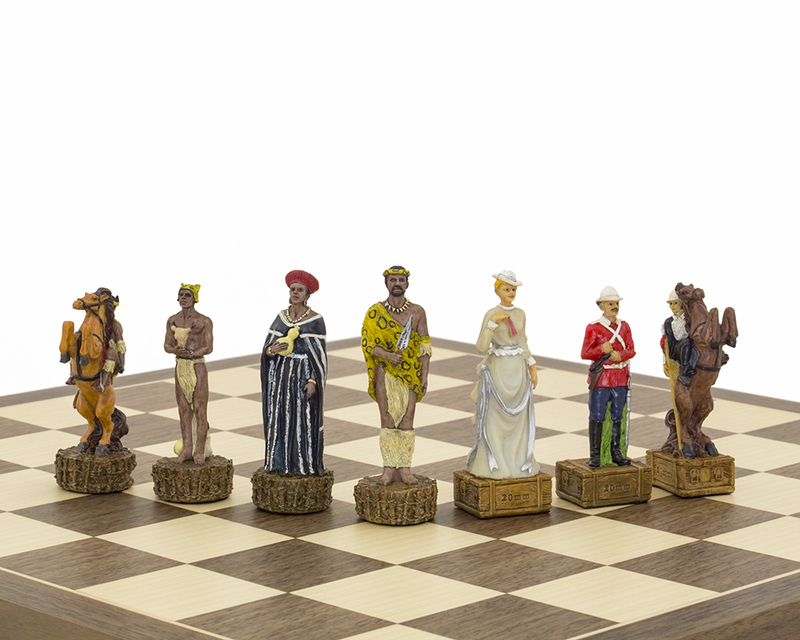 We have matched these chessmen with a beautiful 15.75 inch walnut and maple board from Spain to give you this enviable set but the The British v Zulus Chessmen are also available without a board. 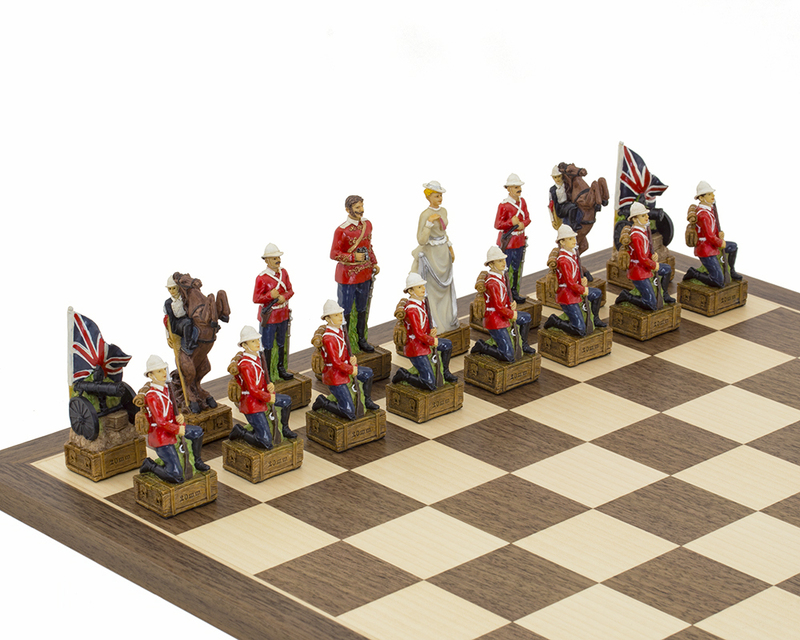 Following a successful introduction of federation in Canada by Lord Carnarvon, it was believed that a similar political tactic backed with a military involvement might be as effective in South Africa. It was Sir Henry Bartle Frere who was sent, as High Commissioner in 1874, to develop these plans. However, some time later in December 1878, Frere, off his own initative and without the consent of the British government, handed Cetshwayo, the Zulu king, an ultimatum. This ultimatum was made with the intent of instigating war as there was no way the Cetshwayo could comply. This non compliance resulted in numerous bloody battles and the Zulu nation’s independence ceased with a British victory. 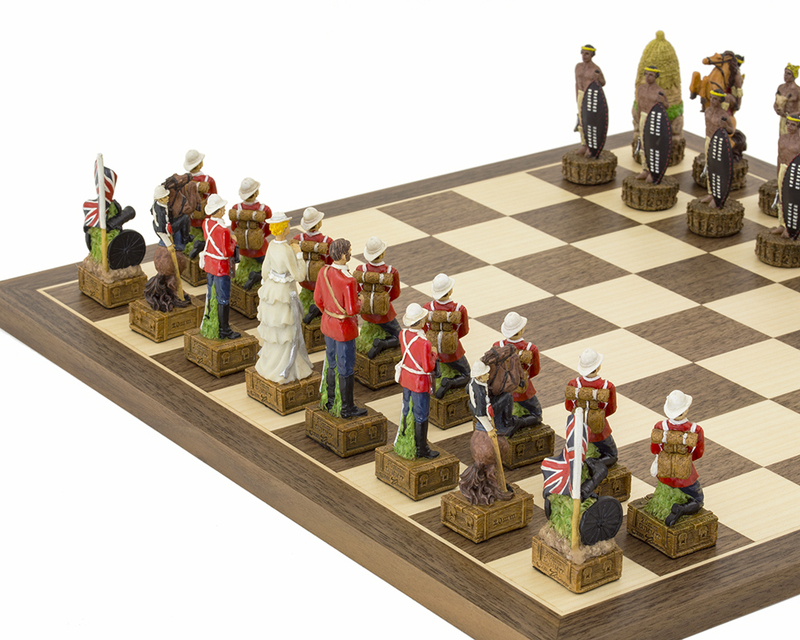 "First class service provided and chess set and board was exactly what was ordered and expected."